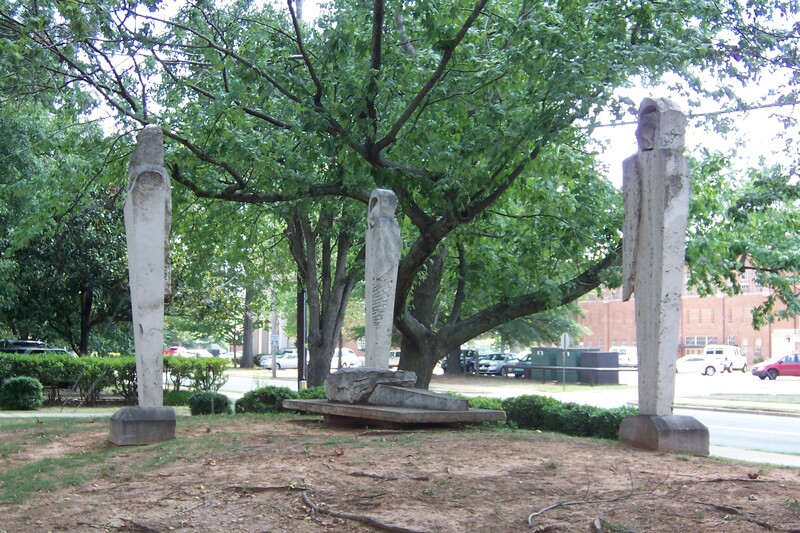 The University of Alabama has a large and growing collection of outdoor, public sculpture. 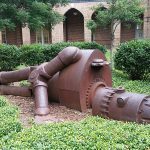 Begun in the early 1990s with the Alabama Biennial, the most recent additions have been in the Woods Quad Sculpture Garden. Life-size bronze statues of our championship coaches as well as fairy-tale-sized animal sculptures are part of our campus-wide treasure trove. 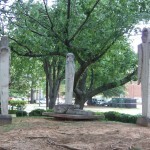 Billy Lee’s Homage to Brancusi, the oldest sculpture here, was the purchase award winner for the 1993 Alabama Biennial. Located in the north and west “crook” of Garland Hall, it measures 38 x 28.5 x 12.5 inches of painted steel. This work is part of the Smithsonian Institution‘s Save Our Sculpture project. Goldie 1971, by Joe McCreary (MFA 2011) 2009, iron and steel; approx. 23 ft. L, 4 ft. T, 5 ft. W; between 3 and 4 tons. Goldie commemorates the history of Birmingham’s Sloss Furnaces and was purchased by the College of Arts and Sciences in 2010. Lying in front of Woods Hall at the northeast corner of the quad, Goldie is a popular photo spot. 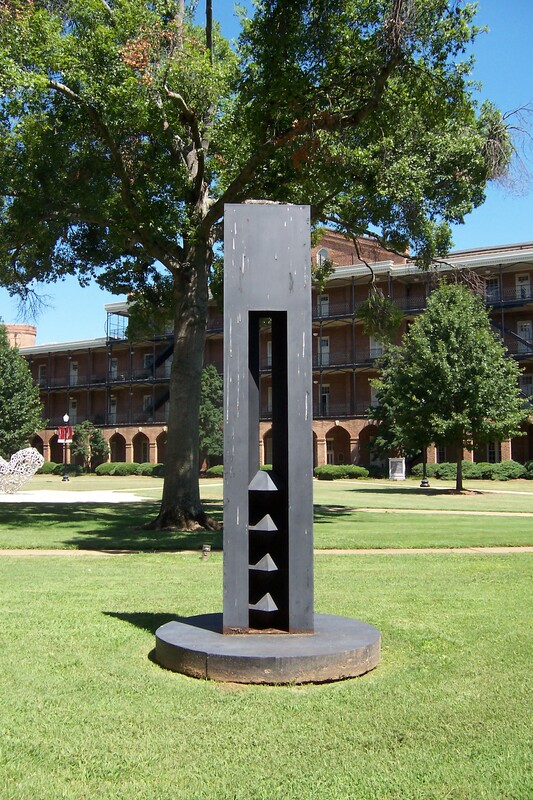 Craig Wedderspoon‘s Montgomery Marker, 2011, 58 x 58 x 58″, cast bronze, stands at the southwest corner of the quad at Manly Hall. It was part of the UA Faculty Biennial Exhibition in 2012. Wedderspoon is professor of sculpture at UA. 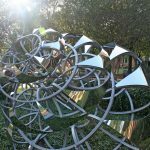 Fibonacci Spiral, by Lindsay Jones Lindsey (BA 2012), stainless steel, dimensions variable, was created during a two-year-long research project involving coursework in Art and Art History, Engineering and Interior Design. Read more about her work here. 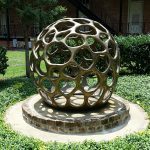 The most recent addition to the Woods Quad Sculpture Garden is Quilted Vessel by Craig Wedderspoon, aluminum, dimensions. 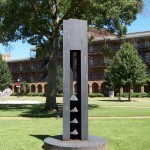 Sited in the center of the quad, it is the third in the series of rotating sculptures here. This piece is the largest in a sculpture group exhibited in a solo exhibition by Wedderspoon at the Birmingham Museum of Art 2013-2015. The newest addition, in the summer of 2018, is Mobius and Borromean Rings by Paget Kern. 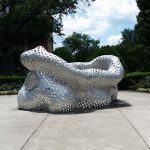 Kern, an art minor, designed the work to link two complex mathematical ideas together in a massive sculptural example. 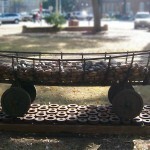 Read more about it here: https://art.ua.edu/loupe/new-sculpture-in-the-garden/. The five works still on campus – by artists Andrew Arvanetes, George Beasley, Peter Flanary, Be Gardiner, and Billy Lee – won purchase awards and became part of what former Arts and Sciences Dean James Yarbrough designated “The University of Alabama’s permanent outdoor collection.” Please visit our Flickr set on the Alabama Biennial and go to Flickr’s map to find each piece’s location on The University of Alabama campus. Internationally acclaimed sculptor Frank Fleming, a UA alumnus who received his MFA in art in 1973, was commissioned by the College of Human Environmental Sciences to create larger-than-life bronze beasts for a sculpture garden at the Child Development Research Center. 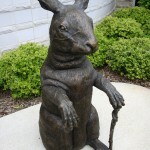 His creations – Peter the Rabbit, John the Turtle and Frank the Frog – were donated by alumna Margaret E. Rhoads in honor of her late husband, John L. Rhoads. For more information about the UA Department of Art and Art History and its programs, visit this link: https://art.ua.edu/academics/ or contact the department at (205) 348-5967. Information about visitor parking is here. Parking is free on campus in a legal space after business hours and on weekends.